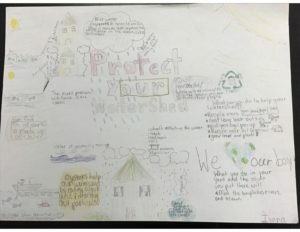 This fall Friends of the Rappahannock (FOR) has been working hard to get students to take action to protect our watershed. Through these projects we aim to inspire the future stewards of the Rappahannock! The following is a list of all the student action projects that have happened or will happen this fall. This is a record for FOR and involves thousands of students! Funding for these projects come from a variety of sources – National Oceanic and Atmospheric Administration (NOAA), Virginia Environmental Endowment (VEE) and the Kortlandt Memorial Grant of the Northern Piedmont Community Foundation (NPCF). NOAA’s Bay Watershed Education and Training is a federal award, VEE is a Virginia state funder and NPCF is a local funder in our headwaters. This funding list illustrates the diversity in funding streams that FOR strives for. It is important for a healthy organization to have a variety of sources, including individual donors! Look for the end of year appeal coming soon and help FOR remain a strong organization through diverse funding sources!